This book is a prime example of why I prefer to read books by English writers in English. The Norwegian translator just hasn’t gotten the nuances of the English language. All I have to do is translate back to English, and I discover that the author’s meaning was completely different from the Norwegian translation. I’m going to see if I can get this book in the original language. All complaints aside, Saving CeeCee Honeycutt is an excellent example of what happens to a child who experiences many years of neglect. CeeCee is a mess by the time her mother is killed while having a psychotic episode. A crazy mom along with an absent dad just doesn’t make for a happy life at 12 years old. Luckily, her neighbor, a lovely Mrs. Odell, was a safe harbour for CeeCee. That and CeeCee’s books made quite a difference to her own sanity, because having a crazy psychotic mom is not something that generally endears people to you. Fortunately, CeeCee’s great-aunt Tootie steps in and brings CeeCee into her home. This saves CeeCee. Her recovery takes time and some wounds hurt longer than others. 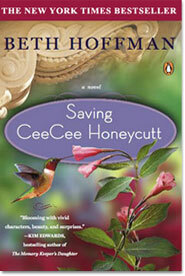 But, like Fannie Flag’s books, the ending is happy for CeeCee. What I really liked about this book is that it shows that it really matters what you do. Tootie could have stayed away and let CeeCee end up in whatever arrangement her dysfunctional dad could have come up with. But she didn’t, and that made all the difference. Tootie wasn’t alone in all of this. Her sister, maid and friends all accepted CeeCee’s presence. That made it easier when CeeCee met the inevitable bumpy people in her road. I know someone like grand-aunt Tootie. When it was needed, she stepped in and saved two children from a difficult life. It hasn’t been easy, but it has certainly made a difference. This is one of my heroes. Knowing a real life example of CeeCee’s experience, makes the story believable and wonderful to read.